Watch out MIT, Caltech, Harvard, Yale, Princeton, etc! His biggest challenge would be to recruit the calibre of scientists needed to head these leading edge science specialities. No scientists in his/her right mind want to be associated with a man who once claimed to be in an "aura of light" when addressing UN general assembly. A delusional optimist with a touch of narcissism. Looks like you are in need of your meds. Even author of this article and maybe some "annonymus" comments claims to be a "godfather" of Mr. Rouhani.. The mixture of your mentioned nacissism and shizophrenia as well as double standards are apparently foundation of the land, where your "assembly" use to reside..
Make I kindly borrow some of your Haldol? 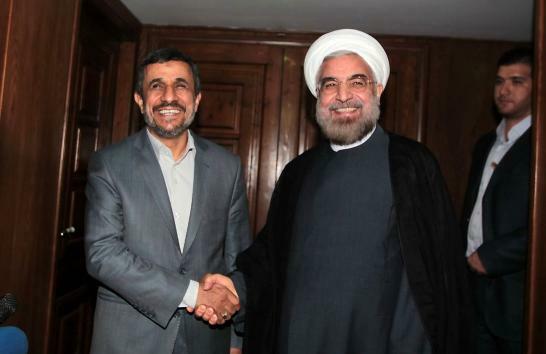 Very noble idea of Mr. Ahmadinejad. When other western "leaders" end their terms, they indulge themselves in their selfishnesses, and create "libraries" of their false "legacies" for brainwashed constituencies. Mr.Ahmadinejad has chosen to serve his nation instead, in a much superior and not comparable way, than those western clowns. His visions, if not disturbed or sabotaged, can and would bring new technological epics to the honorable nation of Iran. He has more energy to create and contribute for the development of the country in the coming future and he has a chance for the political comeback. The term ' University of Iranians ' perhaps, will be specially, specifically and tecnically designed, built and finally established in the name of iranians only. The possibilities is; will there be no any non-iranian staff of trainers or trainee in the above mentioned university?